This year's Dark Horse Maverick anthology is an amazing collection of stories by the hottest up-and-coming talent along with the industry's giants. The artists' mission was deceptively simple: in one way or another, each tale had to work with the theme of happy endings -- literally or otherwise. Regardless of the approach, every creator involved poured heart and soul into the work, and the results are astounding: from Gilbert Austin's Depression-era hucksters "Barley and Diggs," to Brian Michael Bendis's autobiographical convention tale "Only In..." to Mike Mignola's fractured fable of "The Magician and the Snake," the stories are as varied as the creators themselves! Best of all, the book itself is even bigger and badder than before. 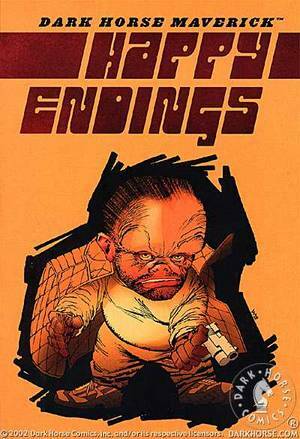 Coming in at a hefty 96 pages and packaged in the compact 6"x9" format, Happy Endings continues a solid annual tradition!